This article is about the ability exclusive to Tiny Kong. For other teleport pads in Donkey Kong 64, see Bananaport Pad. Tiny about to Monkeyport to the lobby entrance of Hideout Helm. Monkeyport (Warpum Craftious) is an ability that Tiny Kong can use from a Tiny Pad in Donkey Kong 64. She can learn this move by purchasing a potion from Cranky's Lab at Crystal Caves for seven Banana Bunch Coins. 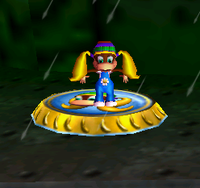 While Tiny is standing on a Tiny Pad, the player can press to teleport her to another Tiny Pad within the level. This ability is essential for reaching Hideout Helm's lobby on Crocodile Isle. This page was last edited on March 5, 2019, at 16:15.